Radiator maintenance is an integral and often forgotten part of the standard generator maintenance. 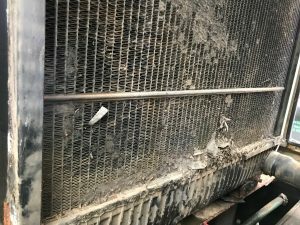 If your radiator is filthy, then you’ve got the wrong people looking after your equipment. It’s so important that you are getting your generator serviced regularly by professionals that know what they are doing. Regular generator maintenance and servicing is the key to the longevity of your generator. Trust us it will pay off in the long run as the longer your generator lasts, the less you’ll have to spend on brand new generators! Here at PowerGen Australia, we are experienced professionals and offer generator maintenance services. We’ll provide lab-tested coolant and oil sampling as part of our standard maintenance schedules, which is an absolute must for all sizes of generators. Don’t let your radiator and cooling system let you down, make sure you’ve got the right people looking after your generator! Contact our friendly team today to inquire about our generator services. Firstly diesel generators are very versatile and can be used as a standalone power system or can integrate into a complex continuity program. We stock diesel generators that are ideal for a variety of industries and situations, with ultra-silent generators for the event and entertainment industry as well as diesel generators suited for the rental, mining and construction sectors. Our diesel generators are environmentally friendly with low fuel consumption, highly compact, energy efficient and reliable. You can rest assured that our generators are of the highest quality as we only stock the top manufacturers such as TecnoGen, Kohler and JCB. If you’re interested in diesel generators you can view our full range online or contact our friendly team to discuss your power needs. Well, would you look at that… it’s 2019! It feels like just yesterday we were cheersing our champagne glasses to ring in 2018. Now that we’ve all had a week to recover from the beers, sun & food coma of the holiday season, it’s time to get back into things and put some power into your year. Is there a new project you’re working on that you need to power up? Or is it simply just time for a refresh in the generator department? Here at PowerGen Australia, we have plenty of generators for sale. We stock high-quality generators from top brands, such as TecnoGen, Kohler, Perkins, JCB, John Deere, Volvo, Leroy Somer & MeccAlte. If you’re after something with tons of power for big jobs & sectors, our range of diesel generators will do the trick. Each diesel generator is robust, fuel efficient and environmentally friendly. Need something a little smaller? Our petrol powered portable generators are perfect for a last minute job or event. Get in touch with our expert team today to find the perfect generator or portable generator for your job. We’ve had a wonderful holiday, but we’re back and ready to bring power to 2019! Have you ever wondered how much easier things would be if you could manage and get updates about your generator on your smart phone? Lucky for you, JCB is one step ahead of you! We are proud suppliers of JCB diesel generators, which means we get to supply incredible innovation like the JCB LiveLink for Power. So, what exactly is the JCB LiveLink? It is fitted as standard on all JCB generators over 60kVA to provide real-time information. You can manage generator maintenance, monitor run hours and receive service alerts to improve maintenance planning and coordination. And you know what that means – you will be told when your diesel generator needs servicing, so there’s no excuse for missing out on maintenance! Servicing your generator is crucial. Treat your generator like a luxury car – you wouldn’t spend a fortune if you didn’t plan on taking care of it. Here at PowerGen Australia, we offer tailored and pro-active maintenance service to suit your budget. We do our job so that you can run your generator at maximum output with complete confidence that we’ll keep it running. Timely data from JCB LiveLink combined with our maintenance expertise is the perfect recipe to keep your generators running smoothly. Looking for a generator to get a specific job done but don’t want to commit to one long term? The all new JCB range of Rental Spec Generators are now available from PowerGen Australia. These units are available with heavy duty skid base, choice of 12 & 24hr bunded fuel tanks, DSE4510, 8610/20 controllers, oversized fork pockets, centre point life and outlet packages to suit all of your rental applications. These JCB Rental Spec Generators are versatile and flexible, allowing them to be the right solution to any of your diesel generator needs. JCB Rental Spec Generators provide innovative, efficient design, cutting edge technology and marketing leading telemetry. Providing power from 19kVA-1250kVA. Each generator boasts all the quality you’d expect from JCB. If you have any questions, our team of experts is happy to help. Get in touch today! A few weeks ago we were given the privilege of load bank testing 3 x Olympian 165kVA generators. Not only were we able to provide some excellent maintenance to these generators, but we got to spend the day by the sea to do it! Not a bad gig if we do say so ourselves. Load bank testing is an essential part of diesel generator maintenance. It is a way of validating the correct operational performance and battery life of the generator under load conditions. This allows us to know when batteries need to be replaced and is a great form of preventative action. It can be compared to test driving a car. You wouldn’t just look at a car, turn it on and agree that it works well. You need to take it for a test drive to ensure that it works properly and to see if any services are required. This is the same as generators. Load bank testing gives us an indication of any actions that need to be taken to maintain the generator. When was the last time your generators were load bank tested? At PowerGen Australia, our expert team is well equipped to provide resistive and reactive load bank tests to your generators up to 1000kW. We can also take care of all mechanical and electrical labour. We offer tailored and pro-active maintenance services to suit your budget. Get in touch today for any maintenance on your generators. Have you heard the news?! We’re moving to a brand new facility down the road! With huge growth seen in our generator sales and service business, we needed to expand our workshop and storage area. A huge thanks to our team of experts for providing our clients with incredible service. Not only will we have more space to work, but we’ll be able to hold more stock. This means faster and more efficient service and deliveries of JCB, Kohler and TecnoGen generators! Here at PowerGen Australia, we have generators big and small available for purchase Australia-wide. If you’re interested in purchasing a brand new generator, don’t hesitate to get in touch! We have a huge range of diesel and petrol generators for any type of job. Our team is ready to handle any of your queries and will point you in the right direction. The excitement here at PowerGen Australia is through the roof as we continue to grow. Our expert team works so hard to ensure that we are delivering the best results for our clients. We have recently been awarded a 3-year service deal for 3 x 1,850kVA diesel generators and 2 x 525kVA gas generators in Sydney! This deal is a reminder of the importance of servicing your generator. No matter how great the generator (and trust us, we’ve got great ones!) it still needs to be serviced. If you want your generator to stay in shape, it needs to be maintained. You wouldn’t be able to run a marathon without maintaining your endurance and keeping yourself in check. The same goes for generators. They won’t last as long as they could without the proper servicing. We understand that generators can be a large expense, so when you invest in one you’ll want to make sure it lasts! Give us a shout if you have any queries about the maintenance and servicing of your generator. Did we mention we have any expert team?! We can help you with any questions or concerns. We reckon our range of generators are some of the best, but like anything, they have to be maintained. General maintenance services are required to ensure their longevity and reliability. This consists of ongoing engine and alternator maintenance. Although it isn’t just this maintenance that will keep your generator in good working condition, it’s the weatherproof canopy. You wouldn’t drive a car without windows, would you? A weatherproofing canopy will protect your generator from the elements. Without the proper canopy your generator will be exposed and can be damaged. Your generator should be kept on a dry surface and sheltered from rain and water. The canopy can prevent your generator from filling up with water. It may also prevent rust, corrosion and dust build-up. This may seem like common sense, but a generator filled with water is not something you want as it can lead to engine failure. Unfortunately, not all servicing companies look after weatherproofing and this can be detrimental to the health of your generator. Here at PowerGen Australia, our expert team is prepared to take care of your generator from engine maintenance to waterproofing. Is your current generator service company looking after your generator canopy? Contact the PowerGen Australia team about all generator servicing requirements and weatherproof canopy needs. We are more than happy to help. Diesel generators are the crux of various industries; used to power hospitals, gas stations, airports… the list goes on. It’s important to make sure you’re choosing the right generator for such a massive task. The KM, KD, KV and the Kohler engine powered range of diesel generators by KOHLER are built to power all critical jobs. With a range of generators from 10kW to 4MW, you can’t go wrong. This line of generators has been designed and built with the future in mind; to keep you powered for decades. It’s all about fuel efficiency! Not only are they capable of providing power for jobs big and small, the KM, KD, KV & the Kohler series of engines are the leaders in fuel efficient generators. Powered by fuel efficient diesel engines, Leroy Somer & MeccAlte alternators, Kohler has the best fuel consumption compared to its competitors. Here at PowerGen Australia, we believe that no matter how new or innovative the generator, it is crucial to keep it up to date with servicing. You wouldn’t let your Ferrari go overdue for a service, would you? If you’re interested in experiencing the future of diesel generators, contact us today!